The EUphiles never tire of claiming that if the UK left the EU we would lose our ‘influence’ over the laws that are made and how things are done. When asked to detail examples of this influence they go quiet. It is an illusion. That much is emphasised again in the Telegraph, which reports on the reaction of DEFRA minister, Owen Paterson, to a series of votes in the European Parliament concerning the Common Agricultural Policy. The minister is said to have condemned the votes, which will see farmers paid twice for doing the same work at a cost of up to an extra £2.6bn per year. A substantial proportion of that money is extracted from UK taxpayers and the benefit to UK farmers is trivial compared to the subsidy whores on the continent. The parliament’s agriculture committee, which is dominated by farming interests, backed so-called “double payments” to farmers in order to keep spending on the CAP – currently approaching £50 billion a year – as close as possible to its present high levels. Crucially, farmers will be able to be paid twice for the same work. Farmers who qualify for money from “Pillar 2”, the part of the budget which rewards “green” practices, such as preserving hedgerows, will now get an automatic right to collect money from the larger subsidy scheme, known as “Pillar 1” regardless of how little work they do for the Pillar 2 cash, meaning in effect being paid twice for doing the same thing. […] the agriculture committee voted, in several ways, to go backwards in time. They passed “recoupling”. This re-establishes, on a smaller scale, the discredited practice of subsidising particular crops for the sake of it. It blocked transparency provisions which would have published the names of all the beneficiaries and the amounts they received. If last week’s vote shows the unreformed nature of much Euro-thinking, it also shows up the EU’s flawed democratic processes. These hugely important changes have emerged almost entirely without public involvement, knowledge or debate. The amendments, and the compromises between them which were passed, were produced in private, and even published only a few days before last week’s hearing. With as many as 8,000 amendments to consider on Wednesday and Thursday — though the number was reduced by compromises — there was no time for debate, or indeed for anything but the votes. There is much more besides and reading the whole depressing thing is essential. But this is what David Cameron wants more of, the UK staying trapped inside a corrupt cesspool with Brussels still pulling the strings, with a few meaningless ‘powers’ returned like crumbs being swept from a table. All because Cameron and his EUphile stooges says it’s vital this country is at the heart of ‘Europe’ using our ‘influence’. 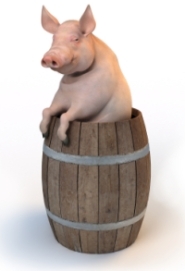 Just where was this famous influence on Wednesday, as British taxpayers were ripped off for even more money amidst chaotic scenes, as our ‘partners’ not only picked our pockets but at the same time voted to prevent us finding out who exactly was going to benefit from this pork barrel pantomime? Nothing that Cameron hopes to reform is going to change this. The only way to stop being abused like this is for the UK to leave the EU. Stories like this make it that bit easier. The reaction within the establishment to David Cameron’s speech pledging an in-out referendum on the EU, if he manages to remain Prime Minister after the next general election, shows how detached and contemptuous its members are. First up we had Ed Miliband, puffing his chest out like a gooney bird in the House of Commons, declaring ‘his’ party would not allow the people to choose the way this country is governed. It seems the socialist dogma of common ownership is limited to taking money from those who have it, to lavish in return for votes on those who want it, but don’t go out and earn it. For Comrade Ed and his fellow travellers when it comes to common ownership of this country, only the self selecting elitists who have served their time in party youth organisations, think tanks and policy units, get to decide. Then we had Nick Clegg chipping in with the same utterly discredited arguments he used in favour of the lunacy of the UK ditching sterling and adopting the Euro, namely that this issue will cause uncertainty for business and the economy and jobs and investment will be at risk. Trust the people? Trust them to do what? Why, to do what Cameron wants them to do of course! It speaks volumes of the establishment that this issue is presented in terms of ‘trust’. Democratically-minded people would not be talking about trusting the people any more than they would be declaring they would not be holding a referendum. True democrats would be talking about letting the people decide and seeking the people’s consent. They would be talking about representing the wishes of the people. But that doesn’t occur to the likes of Cameron, Clegg, Miliband or hacks like Nelson. These are people who belive they have a divine right to impose their wishes and dictate what will be to everyone else, and those who are their cheerleaders. When it comes to democracy they just don’t get it. That is why we need to be sceptical and suspicious of the motives of all members of this insular, self serving crowd. They are not trying to serve interests, only their own. It was the kind of speech one should expect from a privileged individual, who has been brought up with a sense of entitlement to rule. Cameron has a misplaced belief that in spite of all evidence he alone can change a decades-old destination; while leaving intact the structures built to enable its eventual arrival, ignoring reality and insisting that political union is desireable can be made to be democratic and be achieved while leaving nations states in charge of their own affairs. 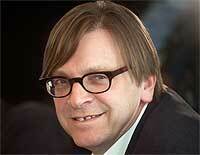 This was less David William Donald Cameron, more Hans Christian Andersen. But no one who has paid any attention to this man’s approach and behaviour will have been surprised. We cannot do justice to the response needed to David Cameron’s speech and tackle points that need to be rebutted with an immediate blog post. So a considered and detailed response will be forthcoming in the coming days – drawing upon evidence Cameron simply refuses to acknowledge. The die has been cast and it is what we expected. Everything is being put together in a way that maintains the status quo. We now have the time to counter Cameron’s assertions and whimscal ideas with hard fact, and time to share it with people acriss the UK who perhaps feel there is more to all this than meets the eye. They are right. The clarity they are seeking will be published soon. Why did YouGov change its EU opinion poll question format? In the previous post this blog referenced a big change in voter views captured by YouGov if there was an in-out referendum on EU membership. The Better Off Out campaign has an invaluable post on its blog that highlights the findings of a poll watcher, Leo Barasi, who spotted that YouGov had changed the question structure of its polls and then claimed an “opinion change“. You can read Leo’s post and follow up on the Noise of the Crowd blog. When writing my previous post, Peter Kellner’s political leanings were a consideration, but these were pushed aside as it felt unlikely that a seemingly reputable pollster like YouGov would be so unprincipled as to lead respondents in a particular direction. Now I’m not so sure. YouGov needs to explain why it changed the format and explain the poll sample is therefore not like for like. What this underlines is the EUphile side is active and vocal vocal and trying to defeat the EUsceptics before they effectively counter the scare stories about withdrawal. We have seen this in the media in recent weeks with a flood of op-eds all pushing the ‘in’ line, and now we have interesting changes to the poll format by the company run by the husband of the EU’s unelected Foreign Affairs representative, Catherine Ashton. The EUsceptics need to get in the game right now and challenge the spin and distortion that is worrying some voters who previously wanted the UK to withdraw. Then even if YouGov walks poll respondents down a path they can still say no because they are informed about how the UK can leave and protect its economic interests. But when such a straightforward question does get asked, it is posed out of context and the answer given by the political elite is accepted unmolested by any form of challenge. Someone’s interests are being served here, and it isn’t that of the general public. When Cameron declared ‘we are all in this together’ he must have meant the political class and the media. 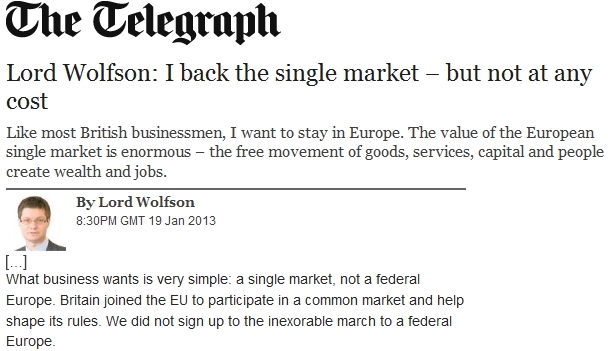 The ‘Next’ up on the conveyor belt of ‘business experts’ to offer their prestigious insight in the pages of the media claque is Baron Wolfson of Aspley Guise. The former Simon Wolfson, this man is Chief Executive of Next, a Conservative Life Peer since 2010 and was a financial backer to David Cameron’s leadership campaign in 2005 – exactly the sort of man the Telegraph would run to for comment. But despite an expensive education and even more expensive remuneration package, Wolfson demonstrates a frightening lack of knowledge about a subject that has enormous impact on the business he runs. He joins a long line of establishment and business figures who unwittingly or deliberately conflate EU membership with being part of the single market, despite them being separate as shown by . But his comment goes unchallenged as the media refuses to do anything that will remind viewers and readers of the reality of the European project, because the media supports the project. Anyone who has taken even a rudimentary look at the history of the European movement will know Britain joined the EEC, and remained an enthusiastic member its all its subsequent guises, knowing the destination was political union. While voters were lied to and spun a tale of only joining a common market, reams of evidence in the years that have followed have been presented to show the political class and civil service knew, approved of and actively pursued full British integration into political union. 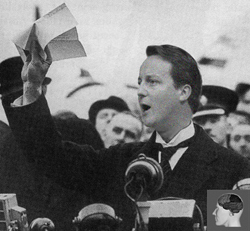 Britain exactly signed up to the inexorable march to a federal Europe. Either way, his intervention in the debate adds no value and leaves him looking stupid. But there is a wider issue here. The media is being flooded with these inaccurate and misleading editorials and op-eds, part of an effort to rewrite history and make ordinary people accept the distorted record as fact. While comment threads online are loaded with rebuttal and corrections, that is not a feature of the dead-tree press bought from news stands. An evidence-based campaign will be needed soon to correct the record in local and national media so people can see how the establishment has lied to them, again. Witterings from Witney picks up on an article in the press about proposals for more 20mph speed limits and enforcement cameras, one in which the well-paid hack has failed to ‘dig beneath the surface’ of the story where the origin of legislation is concerned. It indirectly provides more evidence of the fallacy of the ‘fax democracy’ the EU supposedly dictates to non-EU members of the European Economic Area (EEA). It is a valuable piece that all readers would benefit from taking on board, as it shows that much of the legislation being introduced by national governments – and the European Union – is not ‘home grown’ and does not even originate in the European Commission, but rather is formulated by sovereign nations and handed down by UN bodies to which they have acceded. The EU’s ‘common position’ as representative of its 28 member states therefore mean each member state has less of a voice in shaping these decisions than independent nations such as Switzerland and Norway – who engage directly with the UN bodies to shape legislation with their own voice. As mentioned on twitter by @WhiteWednesday, no doubt – and hopefully – the Swiss “faxed” Brussels to give them advanced warning of legislation they would shortly have to introduce – but I digress again. 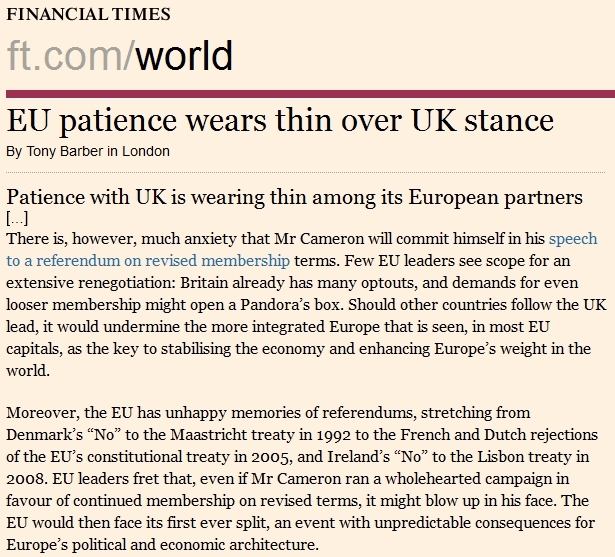 Cam Jong-Eu, Great Guiding Star of the Post-Democratic Century, has been at it again. When it comes to politics only members of the groovy gang are allowed to play. 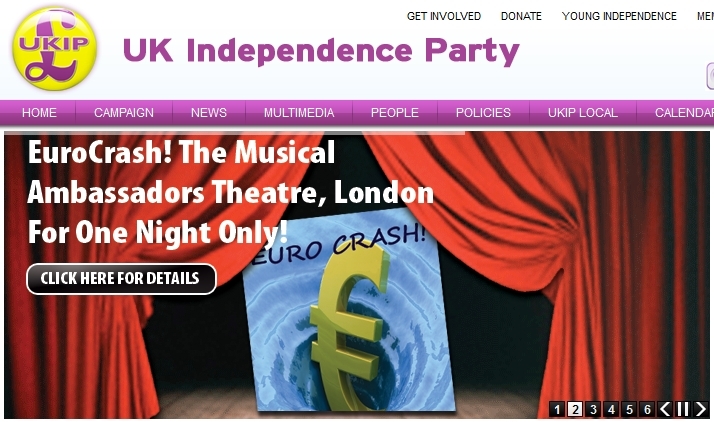 This is an example of the anti-democratic political consensus pulling up the drawbridge, lest any alternative to their cosy round-robin government club might be able to make use of such a high profile platform to expose the vacuous, self serving and ignorance quislings for the treacherous and duplicitous con artists they are. The door is closed to those outside the bubble by the Oxbridge PPE grads who have stolen control of this country’s political system. Today it is Farage being kept on the margins. Tomorrow it could be someone who is genuine leadership material with a sound vision of a positive future for this country. This isn’t about the personalities, it’s about the principle of enabling those people who still vote to be able to make an informed choice about how they cast their ballot within this substandard system. Cameron’s comments demonstrate how party politics is being stitched up to remain the preserve of the three serial failure parties, where no matter which of them forms the government the agenda and outcomes remain the same for the poor bloody citizen. Readers may be shocked that Ed Miliband of all people is getting any credit from this blog, but he performed a valuable public service yesterday at Prime Minister’s Questions – albeit unwittingly. In his desperate desire to give the impression of being a strong leader – stop sniggering at the back – and take advantage of supposed Tory in-fighting over renegotiation of powers from the EU, Miliband accused David Cameron of ‘losing control of his party’. That little soundbite said it all. There, in his own words, Miliband demonstrated he knows nothing about leadership. Among a number of important qualities, good leaders share one in particular, the ability to listen to and take on board the views of people who disagree with them in order to clarify or modify their thinking. Miliband’s perspective on leadership however reflects his dogmatic socialist worldview that leadership is about dictating to people, keeping them under control and only listening to oneself. But what else can one expect from a man whose life has been one long training programme to become an MP; to the extent that he has never done a proper job in his life yet is worth several million pounds and claims to speak for the less well off in society? In what possible way can he relate to the everyday struggles of we ordinary people outside the establishment? Setting that aside, Miliband unwittingly showed complete contempt for Labour Party members by trying to portray himself, in contrast to Cameron, as in control of his party and its MPs. The party is owned by its members, not Ed Miliband. Such arrogance is nauseating, yet uniform among the establishment claque of which Miliband is a youth product turned full member. What all this underlines is that the party political process, which is riven with personality politics, does not and cannot serve the interests of ordinary people. It is said if politics could change anything they would ban it – that is only true of party politics where mindsets such as Miliband’s and Cameron’s are all pervasive. Politics is far broader than the narrow interests of political parties, stuffed with control freaks who devote their lives to lining their pockets and accumulating positions of power as far removed from accountability as possible, while telling other people what’s best for them. Grassroots politics and campaigning, without stifling structures and dictatorial leaders, has and still can get things changed. That is why the politicians and establishment fear that approach. We are in a much changed world and living in challenging times. Now, more than ever, grassroots campaigns rather than party politics are the route to achieving ends. Thanks to Miliband more people may wake up to this and see that loose groups with substantial autonomy, that offer a vision for people to support if they wish and gives them space to campaign in their own way, is far more powerful than trying to herd people within a party and forcing them to swallow whole that which an autocrat decrees to be the way things must be. People want proper listening and receptive leaders. They don’t want to be controlled Miliband fashion. As we keep saying about the Met Office’s reliance on computer modelling, ‘rubbish in’ derives ‘rubbish out’. As this piece shows, it’s not just a matter of whether the Met Office models for the stratosphere are right or wrong; it is the absence of peer review and appalling management of their data, coupled with an inability to explain or reproduce the methodology that was used to arrive at their results. How can any government or organisation have trust or confidence in the findings and forecasts of an entity that has such a slapdash approach to scientific method? Never mind. The UK government has the Met Office’s back. Most of the media will turn a blind eye to play down public awareness. MPs will stay quiet on the subject in the House of Commons. Public money will continue being poured into Met Office wheezes and climate alarmism campaigns; and the tidy bonuses will continue to flow to its executives. The science is not important. The money train must be kept running. How the Met Office’s general forecast for London has changed over a 24-hour period. If this is the amount of change the Met Office makes to a forecast in one day how can we possibly rely on longer range forecasts? Perhaps they would do better to spend our money trying to get the basics right, you know, just a day or two ahead so we know what weather to expect before it arrives. David Cameron’s interviews on radio and television about the ‘UK in the EU’ debate have been leading the news today. There have been many myths, distortions and misrepresentations deployed by Cameron, various leading Tories and front organisations such as Open Europe in recent weeks. To start unpicking fact from europhile fiction, Richard has started addressing the technicalities and correcting some of the points that Cameron has made, publishing the facts in an informative post over on the EU Referendum blog. If you have even just a passing interest in this EU membership debate, I cannot recommend his post highly enough. Cam Jong-Eu, Highest Incarnation of the Revolutionary Supranational Love, has spoken. His unique abilities have given him the power to look into the hearts and minds of men and know what they will think and feel in the future, before they themselves are even aware of it. First, despite there being no treaty amendment on the immediate horizon for him to take advantage of, or any likelihood of an intergovernmental conference being called by Herman Van Rompuy, he is confident of getting the undefined changes he wants in the UK’s ‘relationship’ with Europe (the EU). Second, despite many polls showing a majority of Britons saying they would vote to leave the EU if there was an straight in/out referendum, and he has refused to ask the people to decide themselves, he asserts the ‘beating heart of Britain’ knows we need to remain in the European Union. We are truly blessed to have the all-knowing, all-wise Cam as our provincial governor. For all the talk of membership of the EU being in the UK’s ‘national interest’ and the UK having ‘influence’ to shape the EU’s direction, the reality is rather different. The media, which goes to such great lengths to make these assertions, seems completely unaware of its own contradictions on the matter. Another example of that is presented by the Financial Times today. 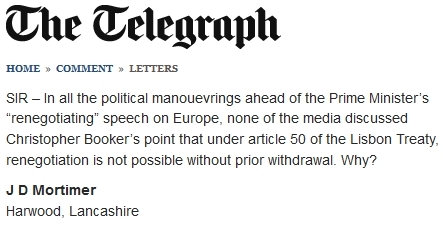 Despite the UK’s much reported influence, we read that few EU leaders see scope for an extensive renegotiation. So where is this great influence? And as we have asked before, if the UK has so much influence in the EU to begin with how come we have such a poor settlement today that necessitates the repatriation of powers? Then there is the national interest argument. The rationale given for EU leaders opposing the UK’s meek request to repatriate some powers from supreme government in Brussels is that it could undermine EU integration that is apparently required to enhance ‘Europe’s’ weight in the world. Further that if the British people rejected any crumb-like revised terms Cameron managed to get tossed down from the table it could result in a EU split affecting Europe’s political and economic architecture. So where in those arguments is there anything about the UK national interest? All that is being whined about is what it could mean for the EU and its interests. All the bleating, cajoling and veiled threats coming out of Washington, Brussels, Berlin and Paris is about the UK doing something that might hinder their interests. The interests of the UK are irrelevant to them – exactly as they are whenever EU law is written, regulations are formulated and trade deals are struck that result in poor terms and outcomes for the UK. As always, it’s all about what they want. The wishes and needs of the British people don’t matter. Truly the Met Office is a world class meteorology department. Their ability to get the weather forecast just right is uncanny – provided you only want an accurate forecast a few hours ahead of the weather conditions. The delightful part of all this is that when challenged about the accuracy of the forecast the Met Office will say they got it right and point to the latest forecast – even though just 12 hours earlier the forecast was somewhat different. What value for money. They really are earning those bonuses down in Exeter.